Therapy Chicago: Racing Thoughts Keeping You Awake? Your mood, health, and productivity are directly connected to your ability to sleep. But what if you’re having trouble getting to sleep because of racing thoughts? Racing thoughts are thoughts you experience that just won’t stop, especially at night. They might be worries, lists of what you need to do tomorrow, ideas about financial planning, future goals, or anything else that’s difficult to stop thinking about. These thoughts can prevent you from falling asleep. If you find that your mind is racing at bedtime, you might benefit from doing something boring before you close your eyes. The two main concepts of this intervention are focus and boredom. You must be able to focus on your chosen activity and it must also be boring to you. Here’s how it works. Racing thoughts can be managed by refocusing. Consider activities that you might be able to redirect your focus upon. It’s best to choose something that you do not find too interesting or stimulating as a stimulating activity will likely keep you up at night. It’s tempting to engage in activities or hobbies that we enjoy late at night, especially if we have a busy schedule during the day. But when we prepare for bed, we need to focus on helping the brain to slow down. Stop any particularly stimulating activities at least 30 minutes before you want to fall asleep. Activities that might be too stimulating include playing video games, watching TV, reading an interesting book, talking to friends, or engaging in hobbies. Boring activities, on the other hand, can help your brain to slow down gradually, which can help you to fall asleep. Try to avoid activities that expose you to blue light. Blue light is produced by many electronic devices, such as smartphones, TV screens, computer screens, and backlit e-readers. Harvard Health reports that blue light subdues the body’s production of melatonin, a chemical hormone that positively impacts our sleep cycle. Harvard Health recommends avoiding blue light for two to three hours before bed. If this is not possible, try wearing blue-blocking eyeglasses or install an app that filters the blue light from your phone or tablet at night. Complete your bedtime routine, then start reading, stitching, drawing, or whatever other activity you have chosen. Once you feel tired, stop and try to fall asleep. Repeat these steps twice if you continue to lie awake. If this is not successful after a few rounds, try another activity. 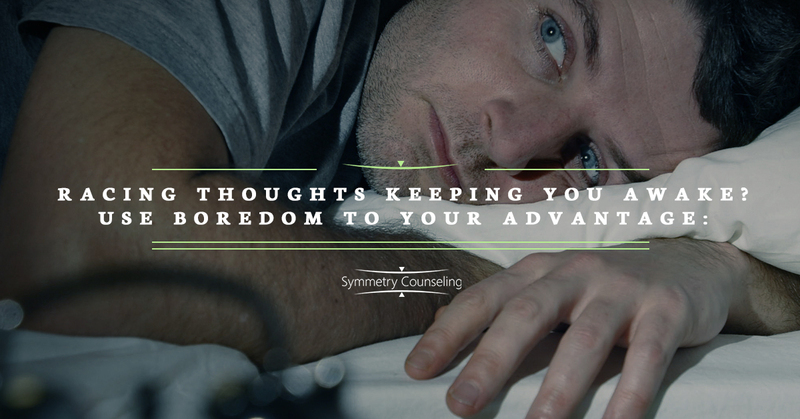 When your thoughts are racing, it can be difficult to fall asleep. Try engaging in a boring activity to help you to quiet your mind and get the sleep that you need. If you’re experiencing racing thoughts or having trouble falling asleep, it may be helpful to work with a counselor. Contact Symmetry Counseling at 312-578-9990 to schedule an appointment.